A little appreciated sentiment indicator is the number of ETF shares created or redeemed over a period of time. When investors have an appetite for an ETF, the shares outstanding increase. When investors pull in their horns, net shares are redeemed. 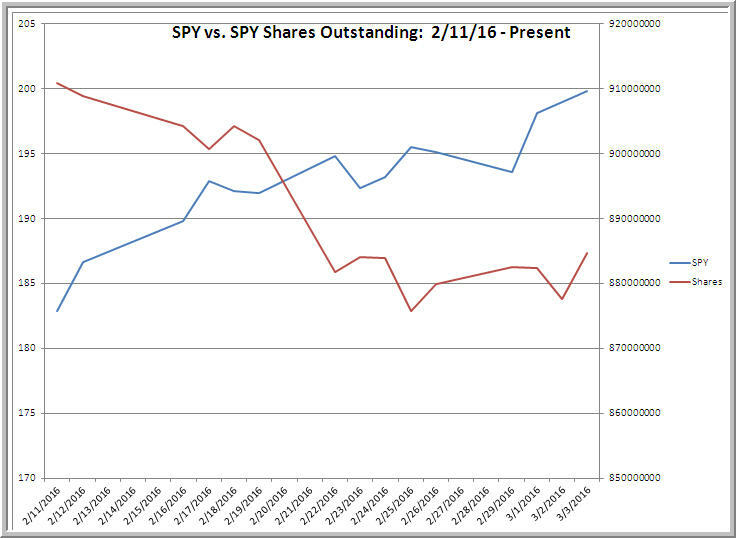 This dynamic makes the shares outstanding for the popular SPY ETF a useful measure of market sentiment. One might think that shares outstanding are a simple function of contemporaneous price change. When prices rise, shares are created; when they fall, shares are redeemed. It turns out, however, that this is not the case. 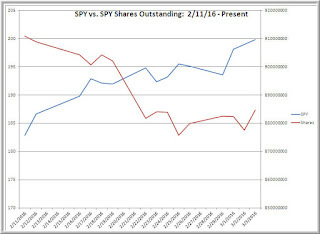 Since 2006, when I first began archiving these data, the correlation between daily price change in SPY and the number of SPY shares outstanding has been -.03. Going back to 2006, when net shares were created over a 20 day period, the next 20 days in SPY averaged a loss of -.08. When net shares were redeemed over the same period, the next 20 days in SPY averaged a gain of +1.98%. In other words, essentially all the market's gains over that period occurred during a time when investors were dumping the ETF. Nor are the data different if we look at the more recent period from 2012 to the present. When shares were created over a 20 day period, the next 20 days in SPY averaged a loss of -.76%. When shares were redeemed over a 20 day period, the next 20 days in SPY averaged a gain of +1.90%. When investors have most demanded the ETF shares, subsequent performance has been most dampened; when investors have most hated the ETF, forward performance has been best. Stocks have rallied hard over the past week and over the past week net shares were created. Since 2012, that has led to subnormal performance over the next week. Still, as the chart above shows, over the course of the recent market bounce from February lows, net shares were actually redeemed. Investors have not believed in this rally and, if history holds, that's one indication that the rise could continue.